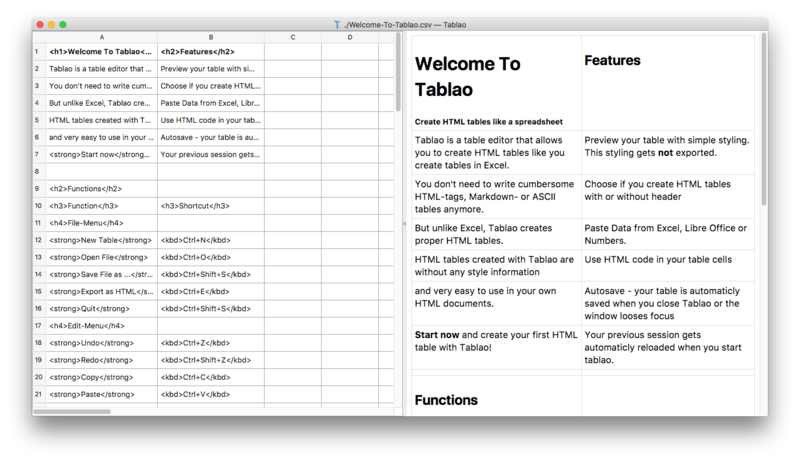 Tablao is a table editor that allows you to create HTML tables like you create tables in Excel. You don’t need to write cumbersome HTML-tags, Markdown- or ASCII tables anymore. But unlike Excel, Tablao creates proper HTML tables. HTML tables created with Tablao are without any style information and very easy to use in your own HTML documents. Preview your table with simple styling. This styling gets not exported. Your table is automaticly saved when you close Tablao or the window looses focus. Use HTML code in your table cells to structure the content of your cells if needed. Paste Data from Excel, Libre Office or Numbers. Choose if you create HTML tables with or without header. Tablao works on Linux, Mac OS and Windows. Tablao is still in an early alpha stage. If you are interested to test tablao, I added installation instructions for all major platforms. If you encounter any problems or have suggestions, feel free to post them at Tablao’s issue tracker. Unfortunately, I was not able to package Tablao for Window either. This is why I provide this installation instruction, that worked on my virtual machine. I hope I can provide am MSI in the future.